Home Food Why Doesn’t L.A. Have More Rainbow Foods? Why Doesn’t L.A. Have More Rainbow Foods? In our new series, Typing With Our Mouths Full, food editor Lesley Bargar Suter and associate editor Josh Scherer sit down at lunch to chat about a pressing (or not-so-pressing) food issue. Since we eat in front of our computers on the days we aren’t dining out, the conversations are typed frantically over IM, and our keyboards are now stained with sriracha and taco drippings. How can L.A. keep pretending it’s a great food city when we have so few rainbow-colored novelty items? 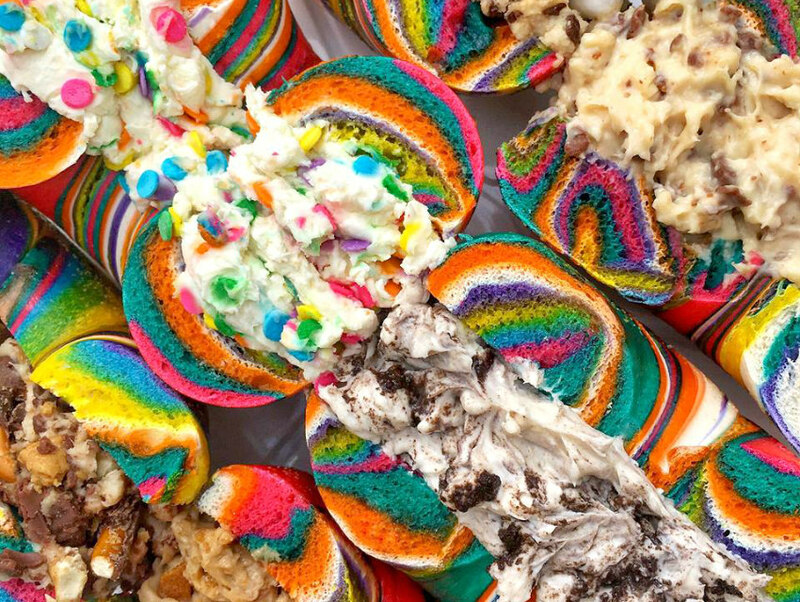 Question: I know strawberry cream cheese is always a no, but then part of me feels like it’s the only appropriate spread for a rainbow bagel, am I wrong? Woahhhhh. That’s kind of mind-blowing. Is that why they haven’t taken off in L.A.? Did New York only get so riled up about them because they have real bagels? If someone in L.A. made a rainbow taco, would we see the same backlash??? ?